How are your post caps sized? Posts are typically sized by 'Nominal' sizes as opposed to 'Actual'. Since there are so many variations of the sizes in lumber, we have chose to list the caps by nominal sizing and any particular or special sizing notes will be listed on the product pages. An example would be a cap for a '4x4' post. Most commonly, a 4x4 measures 3-1/2" square, but we carry caps for 3-1/2", 3-3/4", and 4" posts. When filtering your results, simply choose the nominal size listed and you will find all caps that fit that range of sizes. Posts are sized by actual outside dimensions. That means that a post listed as a 4" x 4" post actually measures 4" x 4", and the post caps for vinyl posts follow suit. The dimensions listed for the vinyl post caps will fit posts with that actual dimension unless otherwise noted. Posts are listed by actual outside dimensions. That means that a post listed as a 2" square post actually measures 2" x 2". The post caps for ornamental posts are sized the same. Dimensions listed for the ornamental post caps are for the actual dimensions shown unless otherwise noted. Post and other framework is listed similarly to dimensional lumber. We use tubing sizes in the fence industry, and there are some common "nominal" sizes that do not match the actual outside dimensions of the products. We list fittings, and framework by the common fence industry sizes, not by the actual outside diameters. If you order a 3" post for example, you will want to order a 3" post cap. Stainless steel is an alloy of iron that contains more then 10% chromium. Its hard oxide coating makes it resistant to stains. If corrosion or wear strips away this coating, however, the steel will rust. Stainless steel, therefore, should be cleaned periodically. One way to clean stainless steel is to use a mixture of vinegar and club soda. Additional cleaning suggestions can be found on the Internet. Will the brass post caps tarnish? Our brass post caps are a true metal brass—an alloy of copper and zinc. They are protected by a thin layer of clear coating. This coating, however, breaks down over time, exposing the brass. Once moisture reaches the brass, it begins to tarnish. A periodic reapplication of the clear coating will slow this process. What preservative is used to protect our pressure-treated wood post caps? Our wood post caps are protected by CA-B (Copper Azole Type B), an EPA-registered pesticide containing copper and azole compounds to protect it from termite attack and decay. 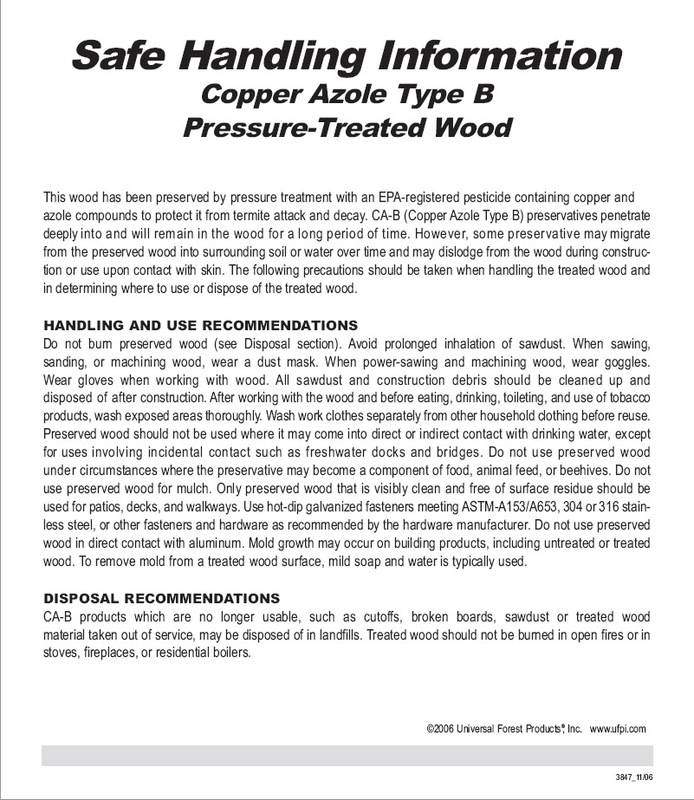 Read More: Copper Azole Safe Handling Information. 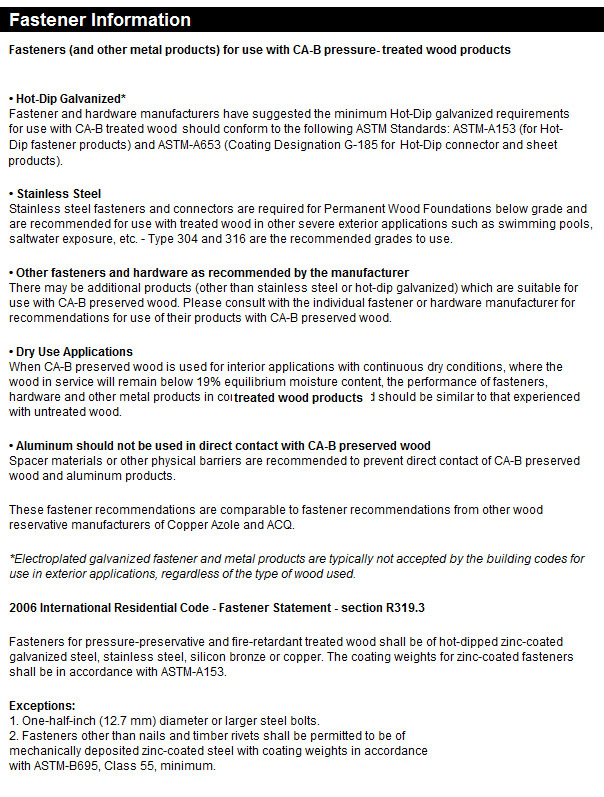 What type of fasteners (and other metal products) should be used with CA-B pressure-treated wood products? Hot-Dip Galvanized fasteners are recommended for use with CA-B treated wood. Stainless Steel fasteners are also excellent for this use. Read More: Fasteners for CA-B Pressure Treated Wood Products. If the rechargeable batteries provided will no longer recharge, they can be replaced with any AA rechargeable batteries. The life depends on the quality of the batteries purchased. Note: We are unable to guarantee the lifespan of the courtesy batteries that are shipped with the caps. Replacements can be purchased locally. With a normal usage of 6-8 hours per day, the LED bulbs should last an average of 10 years. Some can be replaced, many can't. Our white, green, real patina, pewter and black post caps are all treated with powder-coating. Powder-coating is a dry finishing process in which finely ground particles of pigment and resin are electrostatically charged and sprayed onto an electrically grounded post cap. The charged powder particles adhere to the grounded post cap until they melt and fuse into a smooth coating in the curing oven. The result is a uniform, durable, high-quality finish that is also environmentally friendly. "Dentil" refers to the wood frame of the post cap and is one of a series of closely spaced, rectangular blocks that form a tooth-like, dentil molding on the frame of the post cap. Dentil molding, usually found on roof lines of buildings, can also form a decorative band on any fixture. "Patina" refers to the natural weathering of copper due to airborne sulfur compounds, which gradually change copper's surface color. The resulting color, called a patina, depends on location and climate. Salt, moisture, sunlight, ultra-violet rays and pollution can affect the final color. In general, copper progresses from a natural salmon to shades of russet brown and gray, and then finally to a blue-green or gray-green patina color. What is a post skirt? A post skirt is a trim molding for the base of a post. Post skirts are available in 4 x 4 and 6 x 6 sizes, three styles, and three wood species: pressure-treated pine, cedar, and redwood. They can be used alone or in combination. Our post skirts are cut to size, with three sides pre-joined. The fourth side can be easily slipped into place and attached with finish nails, staples, or exterior-grade construction adhesive. Will your vinyl fence post caps match my fence color? Color matching of our post caps to your existing fence or railing can not be guaranteed. There are numerous manufacturers of vinyl products, each having their own colors and color names. White post caps are safe to order and expect to match regardless of which manufacturer makes your fence or railing. Any other color may or may not match your existing vinyl products. Often color matching is not crucial, a slight shade difference may even be desired to add more appeal to the post caps. If color matching is important to you, please request a color sample or order just one post cap to see if you like it. You may return the post cap or order more knowing how it will look on your project. The customer will be responsible for shipping costs to and from the destination and Hoover Fence Company. Refunds will be given to returned items that haven't been installed and are in their original boxes. See the guidelines below for more help on this subject. These post caps are offered in white, tan, almond and clay. These caps will match the colors of our Bufftech Fence and EverNew Railing exactly. These post caps are available in LMT white, beige, almond, and khaki. These colors, other than the white, may not match our Certainteed products perfectly. The following is the closest match for LMT/Bufftech colors respectively: white/white, beige/tan, almond/almond, and khaki/clay. Color samples shown on the post cap pages are only as accurate as your monitor. If color matching is a must, please order a single cap to see if it will work with your application. The same information above applies for the LMT post caps that are offered in choice of white, beige, almond, and khaki. Post caps from other manufacturers may or may not match your existing vinyl products. As before, please order a single post cap if color matching is crucial. How fast will you ship vinyl post caps if I place an order? Shipping times may vary throughout the year depending on the volume of orders we receive for a particular style post cap. Normally shipping times increase as the summer season progresses. The post caps we offer are made by several different manufacturers and each one may have a different situation affecting their shipping times. Hoover Fence Company tries to keep the most popular styles in stock but often in the busy summer months we may run out and be at the mercy of our suppliers. We appreciate your understanding of these shipping times and will do our best to get your order to you in the shortest period of time. As always you can contact us for more specific information on shipping times when available. The guide below shows typical shipping times, please keep in mind that it is simply a guide, times are subject to change during our busiest summer weeks. Standard Post Caps: Normally ship out in 2-3 business days. Most standard 100% vinyl post caps are kept in stock for quick delivery. Some colors/sizes may drop ship from the manufacturer and could require additional time to be delivered. Metal and Glass Top Post Caps: Normally ship out in 4-6 weeks. These post caps are hand made when the order is placed. With all the different combinations of colors and tops, it would be almost impossible to keep all of these caps in stock. The times vary throughout the year with the longest waits being in the summer months. Solar and Low Voltage Lighting Post Caps: Normally ship out in 4-6 weeks. These post caps have become increasingly popular and shortages are not uncommon during the summer months. Please be patient and allow additional time for delivery of these items. We can usually let you know how long you can expect to wait for delivery of these post caps. Feel free to request this information before ordering if time is crucial for your project. An exception to this rule are the Classy Cap® Solar and Low Voltage Lighting Post Caps below. Classy Cap® Solar and Low Voltage Lighting Post Caps: Normally ship out in 2-3 business days. These post caps usually ship in a very short time after the order is placed, normally within 2 to 3 business days. We recommend using an exterior-grade construction adhesive to adhere the cap to the post. Apply the adhesive liberally to the inside of the cap and place the cap firmly over the top of the post. If you prefer to use Brad nails, be sure to pre-drill all nail holes to avoid splitting. To attach our solar post cap light to a post, apply an exterior-grade construction adhesive to the inside edge of the molding at the bottom of the light, and then place the light firmly onto the post. Not all solar caps can be permanently mounted to the post, some need to be removed to replace the batteries. See the installation instructions provided with your caps for individual instructions. Should the switch on the solar post cap light be in the ON or OFF position to charge the batteries? Your solar post cap light will need 24-48 hours of sunlight, with the switch in the OFF position, to fully charge. Once the batteries are fully charged, you can leave the switch in the ON position. The solar collector will charge the batteries during the daylight hours, and the batteries will power the light during darkness. If your light dims, try recharging the batteries again by giving the light 24-48 hours of sunlight with the switch in the OFF position. Yes, the clear plastic cover is meant to protect the solar collector during shipping. Our copper, stainless steel, and brass post caps come with a thin clear coating designed to protect them before and during installation. Once they are exposed to the elements, however, the sun's ultraviolet rays begin to break down this coating, exposing the metal underneath. The copper caps, therefore, will gradually progress from a natural salmon to shades of russet brown and gray, and then finally to a blue-green or gray-green patina. Depending on climate, pollution, and sun exposure, this process can begin anywhere from six months to two years. How do I keep my copper post cap from turning color? There is no permanent protection system that will keep copper from weathering. There are clear coatings that will provide short-term protection for exterior applications and longer-term protection for interior applications. The copper color can be prolonged by periodically re-applying a clear spray lacquer before oxidization begins. You can remove the thin layer of clear coating by using either mineral spirits or acetone. Once the copper is exposed, the patina process can be hastened by spraying the copper with a mixture of lemon juice and water and keeping the cap in a damp place. As with all wood products, we recommend that you coat the wood portion of our post caps with a high-quality, exterior-grade wood preservative to protect the wood's natural beauty and ensure a lifetime of enjoyment. Apply the finish to all wood areas, including the underside of the cap before installation. Consult your local paint supplier for the best product to use in your area. No, our treated wood post caps are kiln-dried and do not require a drying period. We recommend applying a protective finish immediately. How many lights can I install on a transformer? Up to 50 lights. Read your transformer instruction sheet included with your transformer for recommendations. The transformer dictates the amount of lights it will support. What type of bulb is used, and where do I get replacements? The bulb is a standard automotive brake light bulb, and can be purchased at any auto parts store. Can a dimmer switch be used? Dimmer switches are not effective on low voltage lighting. Can the light output be reduced on the low voltage light? A 7.5 watt bulb is available to reduce the light output if desired. Some lights appear dimmer than others, what do I do? This is a result of wiring issues. Primary due to longer distances from the transformer (200 or more feet). There are several different wiring schemes to address and/or correct this. Please refer to the transformer instruction manual to correct. I have low voltage landscape lighting; can I add deck lights to this? Generally, the answer is no. It is best to start from scratch, for two reasons: First, the transformer likely has less wattage output than is necessary for the Aurora Deck lights. In addition, landscape lighting usually uses 18-gauge wire, which is too light for the Aurora Deck Light product. Using this will cause a drop in wattage, making the lights appear dimmer. Can I change the glass style in the light? Yes, glass can be purchased separately to change between the styles. This includes new Tiffany Opalescent Glass in red, white, blue, and green. Can I put the lights on an inside switch? Yes. To do so, the outlet that the transformer plugs into must be wired to the desired switch. The transformer is then placed in "manual mode", operated by the light switch.